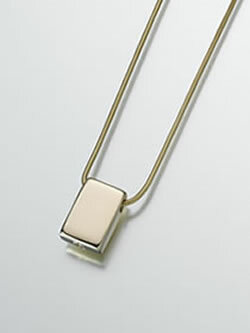 The Rectangle Slide Keepsake Urn is available in Sterling Silver or Gold Vermeil. The Gold Vermeil keepsake is plated with 100 milligrams of gold, the best grade of plating. There is a small screw in the bottom of the pendant that removes to add cremains, dried flowers, or other remembrance. This pendant is perfectly sized and shaped for engraving by your local jeweler. Filling instructions, a care card, and funnel are included. Each pendant is presented in a black velvet gift box.